The zamburak (Persian for "little wasp") was a saddle-mounted cannon used in cavalry warfare in Central and Southeast Asia during the eighteenth and nineteenth centuries. Deployed not for accuracy but to disrupt enemy formations, the cannons were attached to pivots and fired directly from a camel’s back with the animal on its knees. 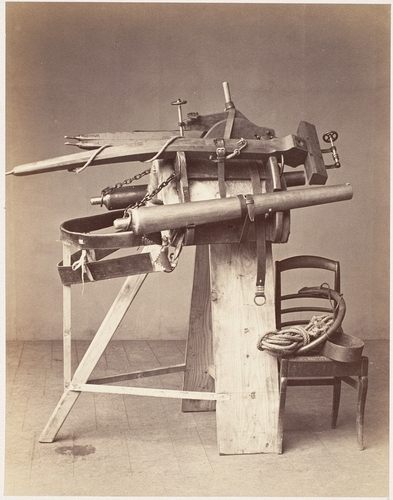 Here a rudimentary sawhorse has replaced the camel, and the threat of the weapon has been defused by the innocuous setting of a photographer’s studio.